KBR #208 - 1 Bedroom/1 Bath Ocean Front unit on Sugar Beach! 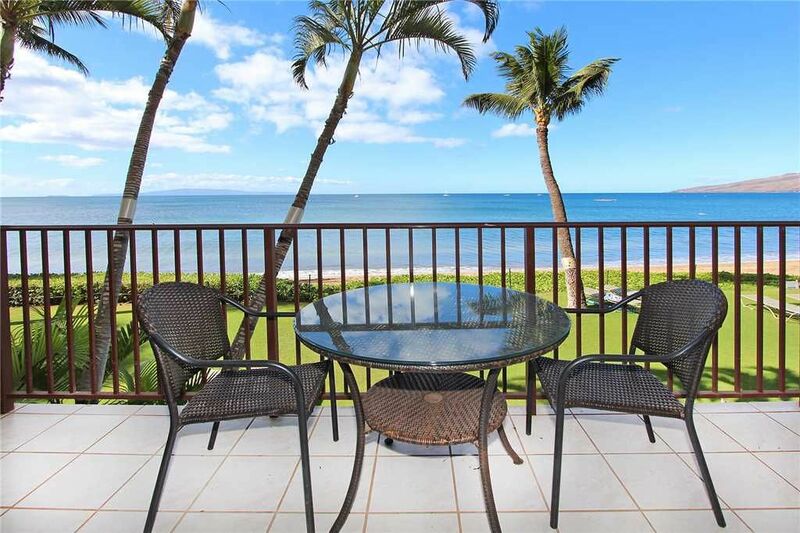 Bright & beautiful, this beachfront 1 bed/bath condo in North Kihei, Maui is on serene, spectacular Sugar Beach. Quality finishes (granite countertops, tile flooring throughout, large mirror wall) & lovely furniture make this unit extra appealing. The bedroom has king bed and flat screen TV; the spacious full bathroom has granite countertops & a walk-in shower with a bench. The living area has a large flat screen TV, and its sleeper sofa allows for up to 4 guests. Prep some meals in the full kitchen for dining on the large lanai—the views are exceptional, stunning, unforgettable. In the winter you can watch whales breaching in the bay, tons of them—and all year round you can enjoy seeing outriggers launch from the canoe club next door, glory in the beauty of tropical sunrises and sunsets, and find peace under the starry night sky. There are coin-operated laundries located on the 3rd and 5th floors near the elevator. This unit is on the 2nd floor of building 8 on the south end of the property. The resort itself is a real gem. Nestled into a quiet and safe community, the vibe here is one of low-key local that lets you know you are in an authentic place, not some theme-resort approximation. Centrally located in North Kihei, Kihei Beach Resort is a favorite of return travelers. From here you can venture forth with low commute times (15-45 minutes) to enjoy most of the awesome adventures and attractions Maui has to offer. Two long & winding roads—one to the summit of Haleakala & the other through the rainforest heading to eastside Hana—are longer treks to places remote, but places not to be missed if one can help it. On days you want to stay close to base, stroll the (almost empty) 3 mile stretch of white-sand shoreline north to Ma’alaea. The resort’s 1.3-acre grounds tempt you to stay and relax by the pool, sunbathe on the beach or claim a lounge chair under a palm tree and read a book. From the grounds & pool you have panoramic, nothing peek-a-boo-about-them coastline views that extend south to the Makena cinder cone, sweep out across the water past Molokini Crater, neighbor islands Kahoolawe & Lanai and north to Maalaea Bay with its backdrop of stark white windmills marching up the sharp ridges of the West Maui Mountains. During high season (Dec-April) humpback whales (mamas, babies, and guardian males) find shelter in Maalaea Bay; the sight of them breaching is always thrilling. All year round you will savor spectacular sunrises and sunsets by day, and star-studded skies and silvery moonbeams glittering on the Pacific by night. It’s fun that Kihei Canoe Club is next door to the resort. Watching the canoes during practices or races is a cool diversion few resorts can offer. On Tuesdays & Thursdays the club offers visitors an opportunity to paddle out with them ($40 donation)—so worth it! Across the street is a quaint collection of local treasures: a farmer’s market featuring local fruits & veggies, Ululani's Shave Ice Store, Sugar Beach Bake Shop & an ABC convenience store. You will find yourself there more often than you think—it’s one of those spots! And just down the road a bit toward Kihei, you will notice a most charming church painted plantation green with white trim & exuding the Aloha spirit. Keolahou Hawaiian Congregational Church holds services in English & Hawaiian on Sunday mornings—open to all; on Thursday evenings they host 808 Uke Jam, a gathering of ukulele enthusiasts of all different levels who play, sing, learn & share aloha; it is free & open to the public. It is priceless. By the way, this condo is professionally managed by Destination Maui Vacations, an on-island management company with more than 40 years of history on the island. Our offices are located nearby with an easy-to-reach, courteous staff. We love to help & will do our best to ensure you have a wonderful stay on Maui! The place was clean and comfortable. Great job with house keeping for the middle of our stay. I liked the location because it was at the beginning of south kihei road, so it isn't too busy. The beaches also stay quieter compared to the more populated areas. There's a great bakery (sugar beach bake shop), farmers market, and convenient store right across the street which was great. Our condo had painting being down on the exterior but the management did a great job at communicating with us before hand to let us know, as well as coming up with a solution to the issue. The condo was clean and comfy. I will be booking here again. I would recommend this property. Mahalo for your feedback! We certainly appreciate you working with us while the team finishes the paint project to enhance our property. It is looking great! We look forward to your next visit. Aloha! The property and location are fantastic! Condo 208 was nice and clean too! However No AC at the time we were there. Destination put a portable AC unit in the bedroom, which helped cool off the room and unit but was Loud! Over all Kihei Beach Resort is Wonderful, But We will not us Destination again. Mahalo for your feedback. It was unfortunate that the AC went out and we did our best to help the situation by securing a temporary AC unit in the bedroom, discounting your stay and offering an alternative location. We do appreciate any and all feedback but do prefer communication while in-house so that we can better accommodate you. Aloha. The accommodations were perfect! The pictures do not give the view justice! If we make it back to Maui, we will definitely look into staying here again! We went south on Kihei almost daily just a couple miles and there is a wide selection of restaurants and shopping. Mahalo for your review! The views on this ocean front property are beautiful and we're happy to hear you enjoyed them. Thank you for letting us be a part of your honeymoon! Aloha. The condo was fantastic. Location couldn't have been better. Literally feet from the beach. We were practically the only ones on it. Condo was nicely updated and very clean and comfortable. My only critique would be the outdoor stairways and hallways were a little dirty. Property management could do a better job of cleaning the building. But the Condo itself was very clean. Thank you for staying with us! We will pass your feedback on to the property manager. We're glad you enjoyed your condo and had a nice trip! Aloha. Overall, it was fine staying here. Had a few minor issues (ants on the counter, remote scrambled upon arrival so no TV first night, and light issue in dining room); however, all were addressed except the light issue - which I reported after the fact. It's VERY close to the beach, and you walk a short distance to end of building (by the pool) to reach the beach area. Chairs and beach towels in the unit, which was nice. Also, a few supplies left by prior guests so check that before shopping. Overall, it was a good experience. The one negative is that it took forever to get our deposit back (no issues; full deposit returned), but I did have to follow up a few times before it was returned. I might consider staying here if I returned. One thing to look at when booking this property: the fees were pretty high relative to other places I've rented. Look at the total and then compare to a hotel with taxes. Seemed to be about the same price for a hotel. Charges were: $55/reservation fee, $125/cleaning fee, $102/service fee and then tax and room cost. Not sure if that is standard in Maui though - were lower on Oahu. Hi there, mahalo for your feedback. We appreciate you communicating your concerns to us while you were here so that we could take care of them in a timely manner. Our records indicate that we returned your security deposit within 10 days of your departure, which is a standard procedure for us. If you were charged a service fee, it was likely from VRBO or another channel partner, as we do not charge anything other than a cleaning fee, reservation fee, rent and tax. I hope that helps to clear things up. We are glad you enjoyed your stay! Mahalo.